Marinara made with care is a marinara that can transform even the loneliest bowl of pasta. In the Leonard household, marinara is often the magic produced by the hands of Cody, or Chef Coco, or Coco, as he’s affectionately called by family and friends. Each time, the marinara is a little different, but there are staple ingredients he reaches for time and time again. This marinara gets taken up a notch with pickled red chili peppers to add a subtle heat, anchovy paste, sun-dried tomatoes, butter and a few other special ingredients. While I foresee your linguine and other pasta tendrils swimming in this marinara, you may want to double the batch and set aside a portion for your next homemade pizza or shakshuka, the easy breakfast, lunch or low-key dinner of marinara baked with eggs and served over toasted sourdough. Add olive oil to a skillet on medium heat. Once olive oil is heated, use a wooden spoon to sauté onion and garlic for 4–5 minutes, stirring occasionally until lightly browned. Season with cracked black pepper. Add tomatoes, water, red wine, salt, capers, chili peppers, anchovy paste, sun-dried tomato paste and red chili flakes. Season generously with black pepper. Stir, cover and simmer for 30 minutes, stirring occasionally. Remove chili peppers and discard. 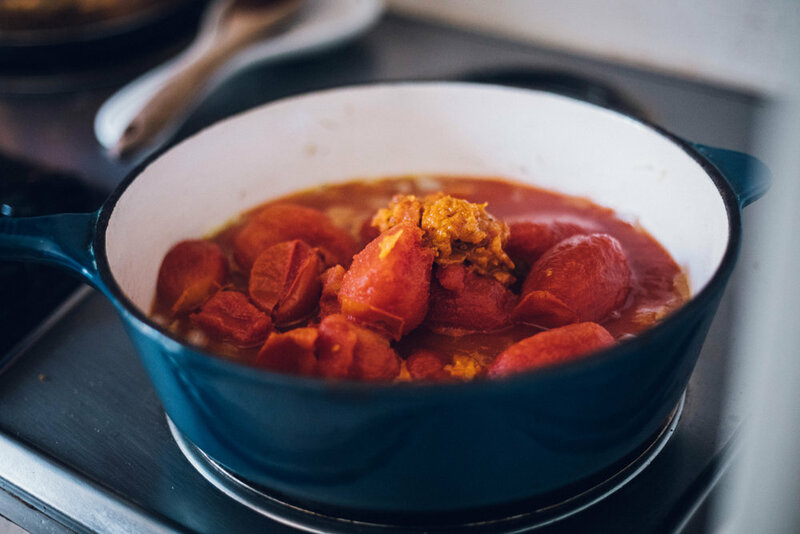 With the back of the wooden spoon, mash the tomatoes to incorporate them into the sauce. Use an immersion blender to blend the sauce into a smooth consistency. Add butter to marinara and stir to combine. Cook down for another 10 minutes, and serve with your next pasta, pizza or other marinara-based dish.